Whether you have just had ankle surgery or have a procedure scheduled, you probably have some questions about the recovery process. Though your doctor can provide specific details about your procedure and what to expect, this FAQ addresses some of the most commonly asked questions. How long does recovery from ankle surgery take? The answer of course depends on the type of surgery and the extent of the injury. Recovery from a minor procedure might take as few as 6-8 weeks; major surgery could require months for recovery. Can I drive after ankle surgery? You will only be able to drive if the surgery was on your left foot and the car is an automatic. If this isn’t the case, you will need somebody to else drive while you recover. When can I bear weight on my leg? The answer to this question also depends on the type of surgery and how much damage there was to the ankle. In some cases, you can bear weight on the leg with a boot walker just a week after surgery. In other cases, it might take weeks before the tissue has repaired enough to allow weight bearing. How can I minimize pain after ankle surgery? Your doctor might prescribe pain medication to take for a day or two immediately after the surgery. Follow the dosage recommendations closely, and stop taking the medication when the pain subsides. You can also apply cold therapy to help reduce pain without the use of medication. The therapeutic cold will numb the area and slow down nerve responses so you feel less pain without any negative side effects. How I do control swelling after ankle surgery? Keep your ankle elevated as much as possible to help prevent the buildup of excess fluid around the ankle joint. You can also help reduce swelling by applying cold and compression. 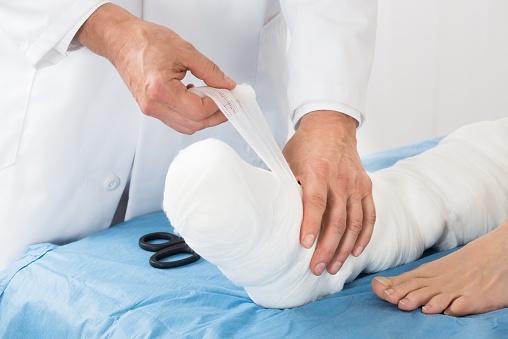 If you are wearing a cast or cannot directly access the ankle in the days after surgery because of the surgical dressing, apply cold to the back of the knee for 10 minutes every hour. When the dressing has been removed, you can apply cold and compression directly to the ankle to control swelling. What is the best way to speed up recovery? Getting ample rest, eating a nutritious diet, and avoiding smoking all contribute to faster healing after ankle surgery. Cold compression therapy is also an effective way to accelerate the healing process by controlling the body’s inflammatory response and allowing therapeutic cold to penetrate deep into damaged tissues. A cold therapy system that delivers both cold and active compression is the most effective means of delivering this type of treatment. Will I have to do physical therapy? Physical therapy helps you regain range of motion, strength, and flexibility. Although it is not always required, physical therapy is recommended if you want to return to normal activity as quickly and safely as possible. A physical therapist can also show you the correct way to use crutches and other assistive devices while you recover. If you are interested in procuring a cold therapy system for use during ankle surgery recovery, find a local provider or contact Game Ready to learn more.